Police arrested four women in North Carolina for allegedly spraying anti-Trump, anti-police, and “Black Lives Matter” graffiti on several businesses and a police car. The women, 22-year-old Taryn Bledsoe, 22-year-old Julia Grainger, 22-year-old Elizabeth Prier, and 21-year-old Hannah Seay, of Boone, were arrested late last week after the graffiti spree took place Jan. 21, the Fayetteville Observer reported. 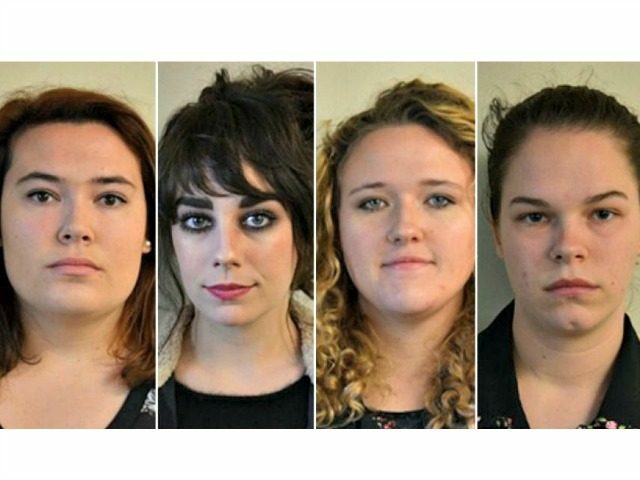 The Boone Police Department charged the women with seven counts of misdemeanor graffiti and one count of damaging personal property, the Observer reported. Police said the women caused about $10,000 worth of damage. Boone Police Chief Dana Crawford said a tip from High Country Crime Stoppers led to the arrests.